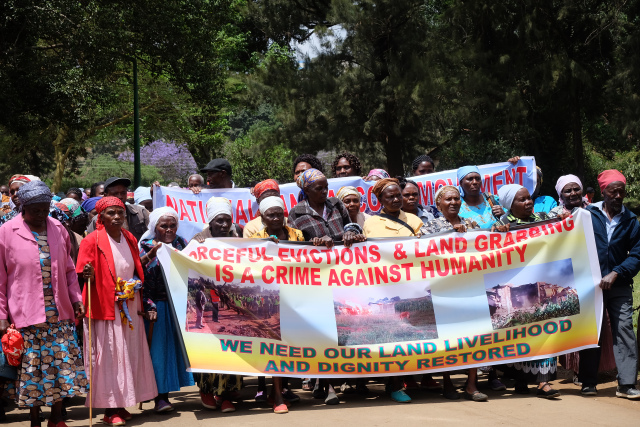 Landless citizens of a location just outside Nairobi have been fighting for their rights to land since Kenya’s independence 50 years ago. Successive governments – including those of two presidents, Jomo Kenyatta and his son Uhuru, who come from the area – have failed to give these people justice. On Tuesday, September 23, the residents of Twiga Farm marched through the streets of Nairobi to hand in a petition to the National Assembly. Their demand was an investigation in the unlawful eviction from their lands, the Twiga Farm, and recognition of their right to return. On Tuesday, September 23, 2014 the residents of Twiga Farm marched through the streets of Nairobi to hand in a petition to the National Assembly. Their demand was an investigation in the unlawful eviction from their lands, the Twiga Farm, and recognition of their right to return.